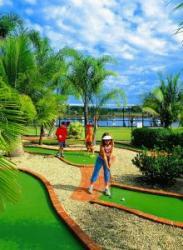 HYDRO GOLF & PUTT-PUTT is considered Port Macquarie’s leading family tourist attraction. Set on Boundary Road with groomed lush lawns, the palm trees and shaded picnic areas create a safe and relaxing surrounding for the whole family. HYDRO GOLF is a beautiful water setting with various floating targets that invite the golfer to win daily cash jackpots and prizes. Prizes you can win include river cruises, dinner vouchers and much more. We provide golf clubs and all the balls for you to hit to your heart's content! After competing against yourself and the water, it's now time to compete against friends and family in a leisurely game of all-ages 27-HOLE PUTT PUTT. Water traps, sand bunkers and creative holes make a challenging and fun game for beginner and novice alike.